Because the new Andrea Moda team didn't have their new chassis ready, they brought two old Coloni cars to the first Grand Prix of the season. Alex Caffi and Enrico Bertaggia were named as the drivers but the team was excluded for not having paid the $100,000 deposit for new teams in the World Championship, team owner Sassetti arguing that it was not a new team as he had simply taken over the Coloni team and not formed a new one. It is unclear though whether two of these cars really existed, as only a car with number "34" was photographed in the garage and on the track. 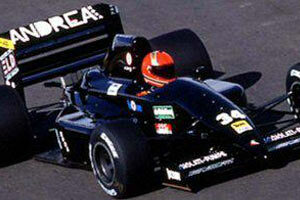 In fact, Caffi ran the car ahead of pre-qualifying at the South African GP for just a few laps before it broke down. Enrico Bertaggio never ran it at the event. At the next Grand Prix, held at Mexico, the team already took their new Andrea Moda S921 chassis and therefore ended the life of the unraced C4B, which essentially is a repainted Coloni C4, fitted with a different engine.